November | 2013 | The Glyn Watkins Show Page. During the interval Glyde House will be serving meat & potato and probably cheese & onion pie and peas for £2, so if you buy your ticket early that’s a show and food for just £6!. For afters you can try (at your own risk) one of my own Bradford-Finnish fusion sweet meat mince pies. I have tested them on willing eaters and they do seem to be one of the best things I have created. You can buy tickets from Glyde House. You can also contact me via the form. I can answer questions and send a PayPal link if you would like to buy from me. 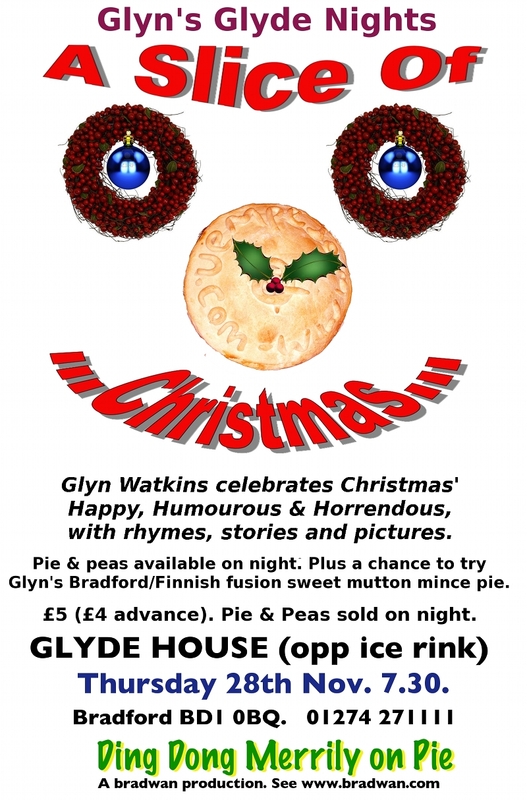 Glyn Watkins celebrates Christmas’ and pies with Rhymes, Stories and Pictures. Little Horton Lane, BD5 0BQ. Call Glyde House on 01274 271111, or use the form to contact Glyn.